Chocolate Crescents, Farmers Wife Original Recipe. Hey y'all!! I'm so sorry I've been gone so much the last week. It's been a long week, and even longer weekend. I'm going to keep this short as I'm not feeling well still, turns out all those migraines I was having were a symptom of a nasty middle ear infection with a bad blockage, which landed me in the ER early Saturday morning. I'm still on some heavy drugs and in some pain so let's get to the recipe! Saturday night we were just exhausted, the Hubby and I had been up since 2:30 am and the little sous chef from about 4:00 am, with just some short naps in the afternoon. I wasn't really feeling up to cooking, but we were all hungry. So I used up the last of the hot dogs I had on hand, split them in the middle and put cheese inside and rolled them up in crescent rolls, not fancy, super easy and totally delicious. But I was left with 4 leftover pieces of crescent dough. Now I debated a few things to do with these, but in the end I decided I wanted chocolate. And after the day we'd had I knew we all deserved a little chocolate, and Voila! These were incredible! Super duper easy, totally hit the spot and I can't wait to try these again! Heat your oven to 350 degrees F. Lightly spray a cookie sheet with cookie spray. Separate out each section of dough, and place one tablespoon of chocolate on the the widest part. Roll them up, and pinch together the ends to keep any chocolate from escaping. Brush the tops with butter and sprinkle with sugar. Bake about 15-20 minutes, until golden. Serve Warm. These were so easy, and incredibly delicious! Next time I will try drizzling the tops with melted chocolate! 4 stars. You poor thing!! And it ain't easy being sick and being a Momma. You're in my prayers! And even as sick as a dog, you're still cooking..lol. What a great sweet treat - so easy, I love it!! It sounds chocolatey and yummy. I hope you feel better and I hope that your little chef feels better also. These look wonderful! I cannot wait to try them! Thanks for sharing, even in the midst of an inner ear infection! I hope you start feeling better! These sound yummy! I would love for you to come and link them up to my baking linky party! What a creative way to use chocolate. Then again, chocolate would be good on a stick of wood. LOL. I hope you feel better soon. Gosh, I sure hope you start feeling better. It's no fun when you don't feel like cooking and eating much:( The recipe looks delish though! Hope that you're feeling better soon. 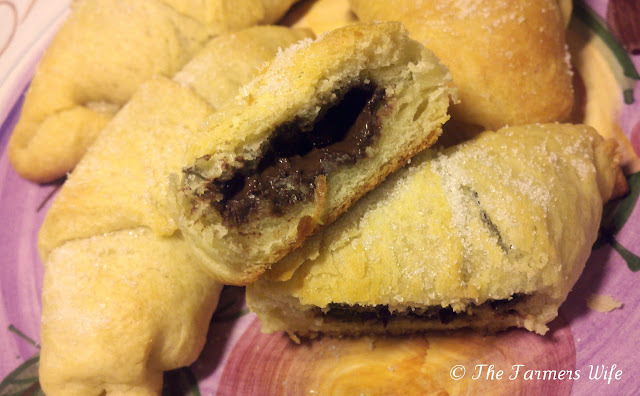 Sinus/Ear infections are no fun, but your chocolate crescents must have made you feel a little better for the moment. Great idea, love it!!! Chocolaty & buttery...YUM. Hope you are feeling better today, I have missed you!!! Hope you are feeling well, Kim!! HUGS! You all are just the sweetest! Your comments really brightened my day, I am feeling slightly better today but still heavily medicated and taking it easy. Hoping to be back in full swing soon, I miss y'all!!! Oh these sound delicious! Love how quick and easy they came together! We never go through a full tub of cresents for dinner, so use the rest for dessert - great! Hope you feel better soon! What a great go to idea when you do not have much time for dessert! What a lovely way to get you back on track. Look after yourself: it's nature's way of saying you need a break!